AS FAR as firepower goes, it's tough to beat a match between Buddy Hall and Keith McCready. And a first-round match - yes, the fans who were there on Monday afternoon deserved a little luck of the draw - between the two stars didn't disappoint. After McCready took the opening game in the race to 11, he blasted open the second rack, very nearly sinking the 9 ball on the snap for a $500 bonus. But nothing dropped, and the Rifleman came to the table with the layout shown in Diagram 1. At first glance, it's difficult to see if Hall could even see the 1 cleanly with the 5 and 3 balls squeezing any possible corridor. It was clear, though, that Hall didn't have enough of an angle to pocket the 1 ball in the top right corner. Hall was fortunate to have just enough room to hit the 1 ball squarely. He was also fortunate to have a bead on a three-rail path to the 9 ball, which was frozen to the inside of the bottom left pocket. Hitting a perfect stop shot with a touch of right English, Hall sent the 1 down-table and off the edge of the long rail. Struck nearly fully, the 9 ball hopped in the pocket, while the cue ball and 1 ball sat at their points of impact. A small but noteworthy postscript: Hall had things worked out if the 9 didn't drop. 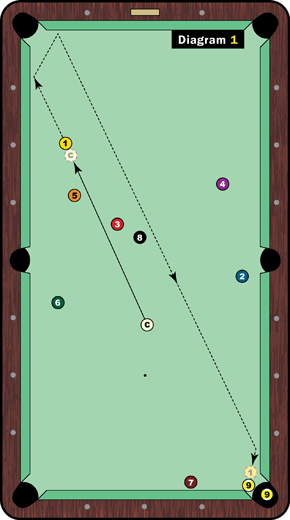 The cue ball stood behind the 5-3-8 ball cluster, while the 1 was struck with near-pocket speed, so it wouldn't have strayed too far from the corner had the 9 stayed up. Alas, the day was McCready's, as he advanced via a hill-hill set that propelled him to a third-place performance that electrified the Chesapeake faithful.